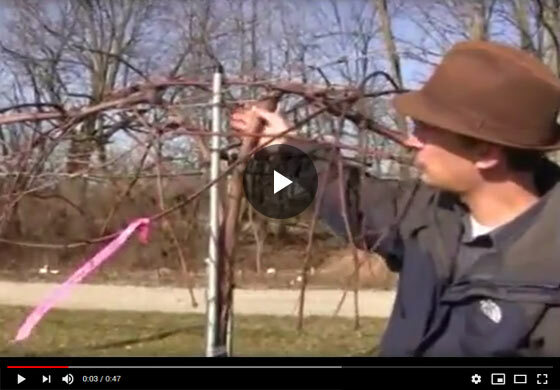 Felix from Gurney's Seed and Nursery sheds light on the process of pruning a grape vine in late winter or early spring. Find out expert tips on how to trim the vines along with some training advice. Hi everyone, Felix here at Gurney's. Today we're talking about grape care in the late winter season, some pruning, and also a little bit about how to train these plants This is a 4 year old grape vine here, we've trained the primary shoot nicely so your planting would be here, you have that cane coming up, it would break a shoot and you'd want to train that nice and straight like we have here for a single curtain system, like we've trained this vine which is really a nice training system for mass production, really good productivity. Basically, we took one shoot and trained it one direction, here for this top wire and took the other one the other direction. We have two primary shoots making up our single curtain, that are on this top wire. So this older vine here has a lot of last season's growth on it, which are these shoots here that are about pencil-thick or a little thicker. And on these shoots are some buds, you can see here, they haven't broken yet, but you can see them if you look closely here. That, right there, is a bud that's going to break, and there'll be a flower shoot off of that. That's where a cluster will form--is on that new shoot coming off here. So for pruning, we look along this curtain here. We have a number of those that have come off last season and really, we only want two or three shoots to break off of this last season's growth. So the pruning approach here is to take these back to--one, two we have another bud on the other side, and there's a third, but I'm just going to leave two there so we're going to trim this back, you can see nice, vibrant green tissue there, and we have a couple of buds. And so we want to do that all along this curtain here, take these canes from last season back to a few buds, that's the goal here. And these low-growing buds--this shoot is growing low and is going to be under the canopy the whole time so that's not doing us any good. And here we have a couple others, a little die back and on the back side here, doing the same thing. We're going to continue to do that. This, again, is growing underneath, and that's not where we want it to be. You can see where we've gotten here, on this whole branch here, this part of the curtain we've taken these shoots back two, three buds and we'll show later, in another video, how the shoots will initiate from there and then you'll be able to see how a flower bud develops off of those. And we'll cover that, so you know how to identify your flower buds and where your clusters will be and then in another video we'll talk about fruit thinning--thinning your clusters, so you get massive berries and just balance the crop load on this vine. And those will be some nice points to look for on some later videos Thanks for joining us.